University Archives, in the Columbia University Libraries Rare Book and Manuscript Library, recently released this archival photograph of George Grey Barnard's sculpture The Great God Pan (C00.825). 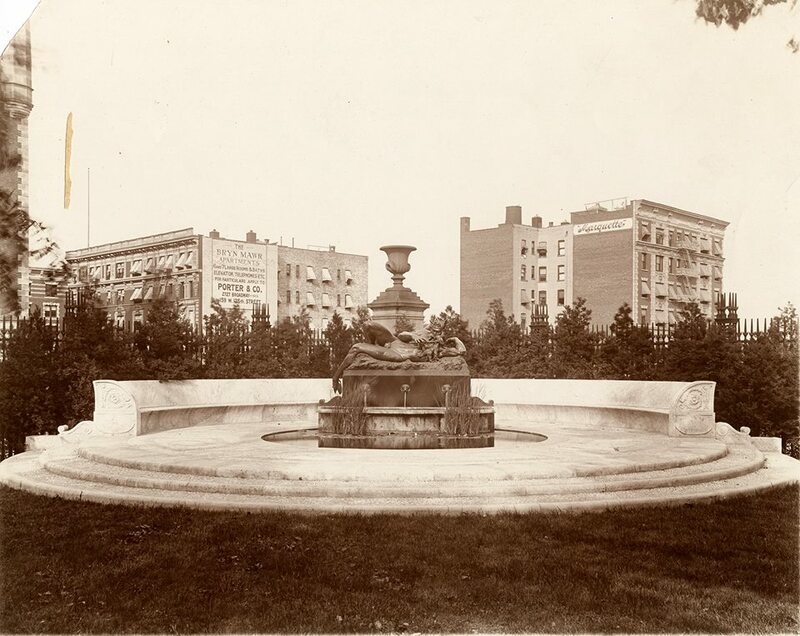 As noted in a previous post, Barnard's sculpture is currently located outside Lewisohn Hall, but it was originally installed as a working fountain in a neo-Pompeiian grotto called the Grove, located in the northeast corner of the campus. 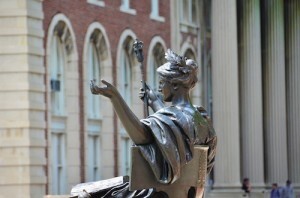 In 1916, Ralph Perry, editor of The Columbian, wrote a poem dedicated to the spirit of Pan and this sculpture, and published it in the university publication (p. 353). The title "Pan Gyrics" (instead of "lyrics") suggests the poem relates to the idea of gyration, moving rapidly in a circular pattern. It may have been intended as a team rally song and dance, especially since it appeared in the publication following an essay on football. Considering the association of the god Pan with nature and sexuality, however, the title arguably may also be a double entendre. We haven't got a bull dog nor an ideal for a totem. For the symbol of our spirit is the Great God Pan. With the love we bear our college–and who knows when that began? When we swear, so very softly, "By the Great God Pan!" All the bigness that is in us, all the glory that runs through us. Aye, may we live forever by the Great God Pan! This entry was posted in Morningside and tagged George Grey Barnard, Pan, University Archives on February 17, 2014 by Roberto Ferrari.